This one went far better than the first one held last April but sold fewer copies of Just Where You Stand. So, which matters more? Feeling good or feeling rich? When it’s a matter of: a. 2 books sold to the receptive crowd and b. 5 books to the sleepy crowd, I’ll take feeling good. To be honest, it was a closer call than that. Group a. included two other very nice listeners, one saying she would borrow my novel from the Library and another man who will be disappointed because I agreed with him that he could borrow JWYS from the library as an ebook and it isn’t true. I wasn’t lying but I certainly was wrong. I have to make that request to the Library to provide ebooks. As a 77-year old person who loves to write but never signed up to be a publicist, book talks given by me are STRESSFUL and take much preparation although I enjoy them once I am actually speaking and can feel accepted by the audience. East York Historical/History Society is an example of an interested audience. My insides thank them a thousand times. Onwards and upwards. George Henry Argyle was a sixteen-year old dairy boy. The 1881 Census for Abingdon in Berkshire, England says so. The milk industry was good for George in more ways than one. Delivery of dairy products even led to his marriage. His future wife probably met him regularly twice every day in the course of their work, reason being that part of his delivery route lay along Marcham Road. Ellen Sessions resided and worked there with her sister Eliza in the home of prominent Town Clerk of Abingdon, Bromley Challenor. The young women had left their parents in nearby Wantage to earn livings as domestic servants. In 1889 George and Ellen were married. A decade later in the 1891 Census year, George Argyle was described as a milk purveyor living with his wife and firstborn Arthur at 14 Victoria Road. Part of that building located on a corner of Edward Street and Victoria served as his newly-owned dairy. This happy change in status had been made possible unexpectedly by the dishonesty of George’s former boss. A little detective work had told George that his employer was watering down the milk which he, George, must sell to disgruntled customers. When he figured out what was going on he quit and in a daring move took the risk of starting up his own business. The Victorian era and the Industrial Revolution must have been inspiring him, goading him to get ahead. Whatever the impetus was, The Argyle Dairy quickly did well enough to have its name inscribed in concrete over its main door. George and Ellen parented four children, Gertrude Florence Mary being my grandmother. The family lived behind and over the dairy and were successful enough to employ a maid who wore the familiar black dress, white apron and cap which we see in old movies featuring more moneyed home owners of Victorian and Edwardian times. The couple followed a steady routine. Each morning after George got raw milk from a farmer along Spring Road, he was returned home standing on his horse-pulled cart, a large urn now full of milk lodged beside him for company. the afternoon the pattern was repeated. George’s two older children helped a bit. Arthur earned six pennies weekly for his deliveries by pushcart to houses beyond his father’s own route and Gertie earned three pennies for light loads carried to two homes in Spring Road. Meanwhile on the Argyle Dairy premises Ellen washed all surfaces thoroughly, churned butter, made cream and served as a salesperson. But George had another interest which would overwhelm all else in his life. In the years of his marriage and parenthood if not earlier, he was known to be an avid reader of Biblical scripture. Around 1900 a sect known as Russellites was becoming popular. They would later rename themselves Jehovah’s Witnesses. George became one of them and in 1903 he sold the Dairy outright, much against Ellen’s advice. Except for the Dairy’s name it would never again be connected with my ancestors. Still, what happened to the business interested me and I hunted down further information. George’s sale of the Dairy marked the end of the Argyles’ hard-won prosperity. He took self and family from Abingdon, longtime home of his line of Argyles, to Reading where he could much more readily attend Russellite meetings. The Battle Street general store which they purchased in Reading turned out to be a very short-term experience. Ellen suffered violent headaches from the fumes of kerosene which was sold from barrels at the front of the premises. Then it was on to an attempt at market gardening in Tilehurst. Ongoing elation in religious terms for George but deep worry financially for him and his wife. Market gardening yielded the couple eager earnings. Their eldest son Arthur claimed ample employment was available in Toronto, Canada where he already was living and working. He urged his father to emigrate. George took the challenge and uprooted family once again. George, Ellen, Gertie, Nellie, John and Gertie’s new husband Jack Ledsham all voyaged across the Atlantic Ocean in April of 1913 aboard the steamship Ascania en route to Portland, Maine and then to Toronto. Charles Burt purchased The Argyle Dairy and living quarters at 14 Victoria Road from George Argyle. His two sons Frederick and Arthur worked with him to advance his new business. Argyle held as the dairy’s name in Abingdon. Charles Burt 1841-1923 and his wife Sophia. A secondary site opened at 19, High Street. It lasted well into the 1980s. Currently this location houses Crumbs Sandwich Bar. Burt still owned the Dairy in 1938. In parallel, since 1906, a dairyman surnamed Candy had been running his own small Abingdon dairy business. In 1933 his son James S. Candy decided, after working and living on a cattle ranch for eleven years in Argentina, to follow in his father’s footsteps as a dairy farmer in the Abingdon area. He rented Milton Hill Farm and abutting cattle land which he worked with his wife Kitty and his father. When Mr. Candy Senior retired, James sought a smaller site to farm. Somewhere between 1937 and 1945 he bought buildings and pasture land from the Tatham family, on the outskirts of town at Northcourt. He also rented surrounding land. That property has a wonderful history. It was once Abbey Grange (1270 A.D.) of Northcourt, started up by the monks of Abingdon Abbey as a branch farm site with at least four buildings which consisted of a tithe barn built by those monks, a cowshed and barns built much later, in 1750. For many years James Candy ran his dairy from that property on Northcourt Road, in a barn which was only three hundred years old. Throughout the 1940s Argyle and Candy Dairies both benefitted from the increased milk demand for World War Two’s evacuee children who were housed for safety with families in rural towns like Abingdon. Business expanded to other villages. Competition between the two and with still smaller dairies was strenuous. When routes overlapped games were played. Opposing dairymen removed each other’s bottles and hid them in bushes ahead of delivering their own brand. The Smiths who still owned the Argyle Dairy, and Candy, were able to buy out practically all the other local small companies and by 1952 the Argyle Dairy was Candy’s only serious competition in Abingdon. By then Candy himself was selling six hundred gallons of milk daily. The two amalgamated in 1956 to become Argyle Candy Dairies. Efficiency increased in all assigned delivery areas, responsibilities were delegated and Candy’s work life eased. He kept a hand in the business, though. In 1956 the very young Queen Elizabeth visited Abingdon to open the restored County Hall which is the centrepiece of the town’s main square. A luncheon was held after the ceremony and dessert was a fruit salad. The mayor had asked Candy to supply cream for the dessert, thick cream from jersey cattle and he gladly did so. Still ambitious, he saw this as a great advertising opportunity. He must have imagined words like ‘As served to her Majesty the Queen’ on his company label. To his great dismay, though, the Queen declined the cream, telling the mayor she had to watch her figure. This energetic man eventually purchased the Grange’s ancient buildings outright although he could own neither the land on which they stood nor the surrounding property where his cattle grazed. Around 1960 he was obliged to give up that outer land and remove his cattle so that a major housing project could get under way there. He then moved into straight distribution of milk. Perhaps this change reduced his workload further because, throughout the Fifties and Sixties he found time, throughout the Fifties and Sixties, to take on numerous civic positions and was elected mayor of Abingdon in 1962. In 1978 Clifford Dairies at Bracknell amalgamated with Argyle Candy but James Candy could not carry on forever. In 1982 after a commitment of sixty years he retired. A larger company known as United Dairies took over. Argyle and Candy were no more although James Candy retained ownership of Abbey structures and some land. In 1996, the Candy family was approached by Christ Church, Northcourt who wanted to buy the Dairy Yard which surrounded existing church property. Christ Church finally won over the hesitant owners and purchased the Yard and its buildings in 2002. An extensive, sophisticated renovation and building project was begun. By 2013 the two adjoined 17th Century barns where the dairy once flourished for many years and which are seen in the picture printed below were beautifully and thoughtfully restored. The cafe at one end of the complex is a bright, striking and welcoming place. The friendly history printed below appears on the cafe’s menu for every visitor to read. Abbey Grange was such an historic spot for the finale of the Argyle Dairy! The Abbey itself was the original centre of Abingdon. Even the name of the town had evolved from the word Abbey. Long before it was Abingdon it was known as Abbeyton and Abbey Town. My deeply pious originally-Baptist great grandfather George Argyle, founder of The Argyle Dairy, could never have imagined that the little business which he let go would find its last resting place at Abbey Grange, on land and in barns where Catholic monks once farmed. How would he, a disciple of John Russell, have liked that? In George’s day, did Russellites/Jehovah’s Witnesses condemn Catholicism as more recent Jehovah’s Witnesses have done? Would he have seen it a further travesty that the Abbey Grange’s still-standing great tithe barn, footsteps from James S. Candy’s Argyle Candy headquarters, since 1971 has housed the Church of England entity known as Christ Church? His faith was deeply embedded. Still, he could have been more open-minded than his beliefs might suggest. Just circumstantial evidence but his burial took place in Toronto in the cemetery of an Anglican church. He and/or the family could have chosen a cemetery unconnected to any particular faith. I want to think that he would heave a peaceful sigh to know where his Argyle Dairy, the entity where once he seriously embedded hopes for a secure financial future, finished its days. 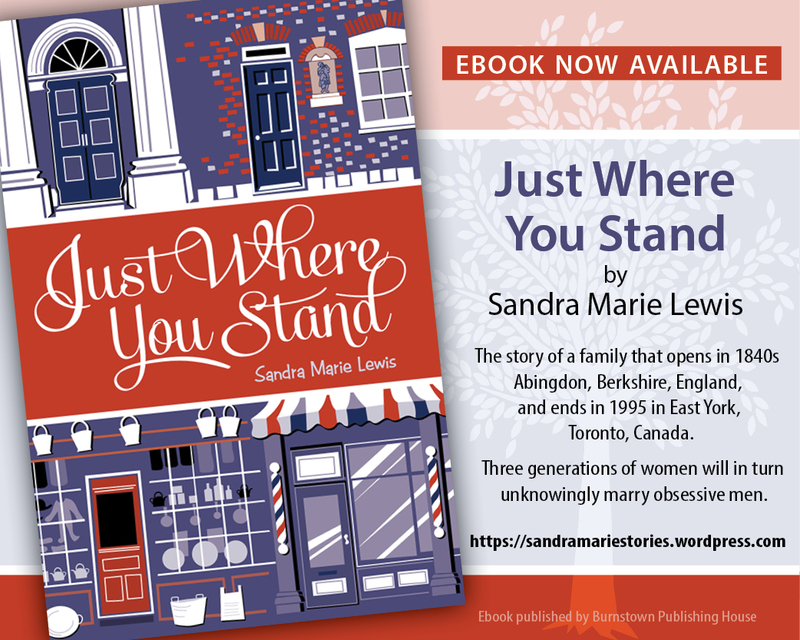 In the Spring of 2017, I attended the annual luncheon for 1950s high school alumni and now, after a year has passed since I made a presentation about my book, Just Where You Stand, an old friend still wanted to buy a copy! The lesson here is always to have a copy of your book in your handbag. You never know. Get Out of The Water, Edna!